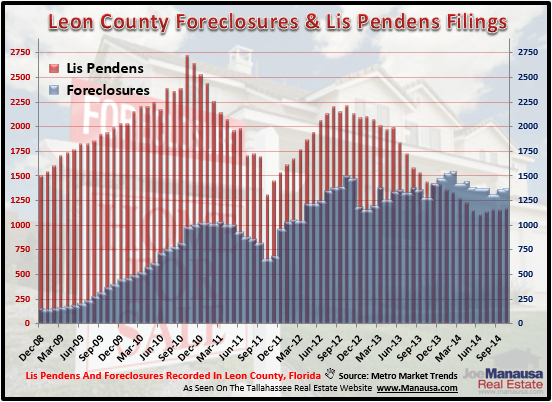 New lis pendens filings in Tallahassee were up 12% in October when compared to October 2013, and it is the third time in the past 4 months that new filings rose over the previous year. Foreclosures rose for the second month in a row, up 19% when comparing the same time periods. The recent trend of growth in lis pendens unfortunately has us concerned, as it could possibly mean that there is still a long way to go before we move the distressed properties through the market. The following list shows the actual lis pendens filed during the month of October.